The Braun Series 5 WaterFlex shaver offers an amazingly close shave and smooth skin comfort even in problem areas. Specifically designed with an anti-slip grip to shave with water, foam, gel and in the shower for a refreshing shaving experience. Electric shaver for an amazing close shave with smooth skin comfort. 33° Flex head keeps gentle skin contact even in hard to reach areas. 3 shaving elements with built-in middle trimmer shaves efficiently - even three-day beards. 100% waterproof and with anti-slip grip to use with water, foam, gel or even under the shower. Razor made in Germany designed to last 7 years, and a Li-Ion battery for 45min running time. 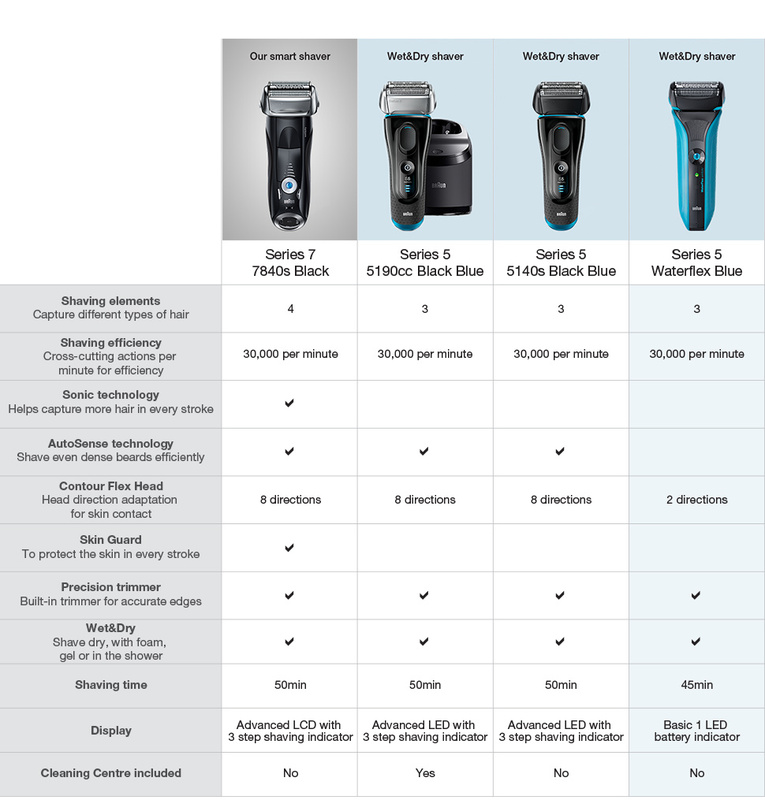 WaterFlex Wet/Dry Electric Shaver Blue with swivel head is rated 4.6 out of 5 by 244. Rated 5 out of 5 by Pedro from Very Good Shave Wet or Dry Bought on line, arrived super quick just after Christmas. Gives a good close shave similar to a blade, but not quite as close. Very pleased with the shave performance, better than my older Braun model Easy to shave with, quick charge and fantastic that you can use gel, which works fine or dry or wet. Great quality and well balanced. Overall great value for the price, shaves well and easy to use.. Rated 5 out of 5 by Georgy from Awesome shaver Got it for christmas and i love it. Easy to use !! Rated 5 out of 5 by Charmbo from Bargain! I was lucky enough to buy this shaver during one of the shaver shops sales! This is the first time I’ve used a battery operated shaver, usually I am an old school razor man. I got sick of paying 25 bucks for a pack of razors at the grocery store. Since buying the shaver, I haven’t looked back. It shaves close, easy to use and a much cheaper option then razors! Is this razor compatible with the Australian three plug electric outlets? Which year's model is this? What length of time can be expected from foil. Also what cost for foil and availability?? G'day, When i looked into this question the advice was 1-2 years of daily use. Replacements are available through the contact on the Braun website, in stores and online. Shavershop lists them at $45. I just purchased this item. How often do blades need replacing? How long do they last before replacement is needed?